Enigma - Return To Innocence: My favorite song on this CD. It has a great tune and very meaningful lyrics. Enya - Orinoco Flow (Sail Away): Hey, if it's Enya, it's good! DJ Dado - X-Files Theme: Who can forget this great theme?! Mike Oldfield - Tubular Bells Part 1: This song always reminds me of the movie, "The Exorcist" and it's very chilling. That's what I like about it! Enigma - Sadeness: Again, great tune. I just think Enigma is EXCELLENT!! Adiemus - Adiemus: A terrific sounding song. Makes me feel like I'm in some sacred place, hard to explain. Jan Hammer - Crockett's Theme: What can I say? Sounds pretty good. Sacred Spirits - Yeah-Noha: An Indian song, I think. It's OK and I enjoy listening to it. Angelo Badlamenti - Fire Walk With Me: This song is very calming. I like it! Geoffrey Oryema - Makambo: Great! Mark Isham - My Wife With Champagne Shoulders: Very soothing. Michael Nyman - The Promise: I really like the tune of this one. Return To Innocence - Enigma. Orinoco Flow (Sail Away) - Enya. Sweet Lullaby - Deep Forest. Oxygene Part lV - Jean Michele Jarre. X-Files Theme (DADO Paranormal Activity Mix) DJ Dado. Theme From 'The Mission' - Ennio Morricone. Main Title Theme (The Last Emperor) - David Byrne. Wishes Of Happiness & Prosperity - Sacred Spirits. Most of the music on this CD is either soothing and peaceful or energetic and might want to make you get up and dance with wild abandon no matter what you do it is sure to help relax you and ease your stress away if you have had a crummy day at school, work, etc. There are only a few songs that I don't like as much and that is the more light jazz selections that seem out of place with the more interesting new age selections but I highly recommend this awesome CD anyway! The first, and probably the best. This collection has been out awhile now, and still stands as the one to beat. It really has the most typical selections of them all, but that's also why it's so good. Included are the obvious choices of "Enya", "Deep Forest", and two from "Enigma". But also really good are "Crockett's Theme", "Adiemus", and the theme from "Twin Peaks". What's missing here has been included on other discs in the series, like "Clannad", "Moby", "Secret Garden" and "Loreena McKennitt". Overall it's a great collection, and though it's more than just "new age" music, it should please anyone looking to get into a "Pure Mood". I've read the other reviews here, and most will tell you some of the songs aren't 'pure' or they aren't new-agey enough, or they aren't relaxing enough...BUT... Every single song on this album can convey to you emotion, depth, and can give you a visualization of another world if you simply close your eyes. The songs were not meant to 'go together' but meant instead to show how music can transform you through itself. David H. definately doesn't know what true music is. His words "Oxygene 4 is not worthy of the album..."
I have to admit that at first I was a little critical of this CD, but after listening to the first two, I became more positive of Pure Moods. The Pure Moods I was erally good, Pure Moods II was okay, but Pure Moods III is the best in presenting some of the best music of the best New Age stars. Most of the music is from the newest releases of New Age performers, most being in the past 5 years, but even so, they still have old classics like "Cristifori's Dream", "Merry, Christmas Mr. Lawrence", and "The Velocity of Love". What I found to be especially amusing about this compilation is it begins with Enya, the New Age "goddess", and Sarah Brightman, "The Angel of Music". Sarah Brightman has done very well lately in the New Age genre, her beautiful voice never lets her down. Enya has been around for more than 10 years, and "Only If", reminds us that she will not go away soon. I might as well give a special compliment to each song. Moby's "Porcelain", which I've heard in commercails, has very amusing electric sounds. Mono sings sweetly in "Life With Mono". Peter Gabriel has been an important figure in New Age and Pop with Real World Records(good thing the makers of this CD included several Real World artsits). David Lanz's "Cristifori's Dream", not only is my favorite on this album, but brings great honor to the beautiful piano and its inventor. Another song by Geoffrey Oryema, "Land of Anaka", is included. Like "Makambo", its from his most well known album, "Exile". Sacred Spirit made a second album and Pure Moods III includes another one of their Native American interpretations. "Merry Christmas, Mr. Lawrence", carries the same oriental moods of "The Last Emperor". "The Velocity of Love", is one of the best examples of the great keyboardist Suzanne Ciani. "Ever So Lonely" by Shiela Chandra is an example of the unique sounds of New Age. 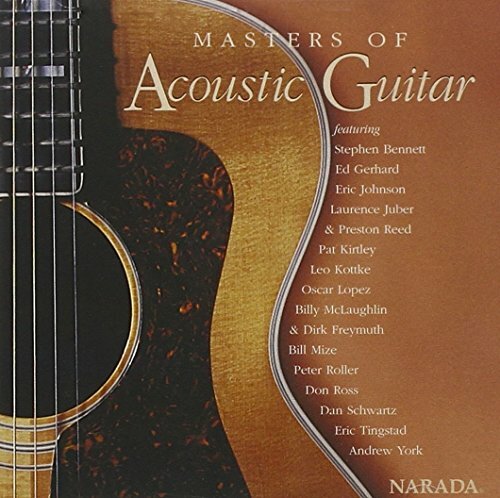 "Virtue" by Jesse Cook, is so reflective, lovely, and fun, just like Ottmar Liebert. The beautiful "Silk Road" by Kitaro, who recently won a grammy, is very peaceful and serene. Even though I've heard and seen much of Blue Man Group and commercials, I enjoyed the sophisticated sounds of "Synaesthetic". Yanni's "Sacred Ground", comes from his more recent "If I Could Tell You", and has many layered sounds and vocals, along with some electric sounds, making it a little different from his previous works. Once again, Pure Mods includes the great band, Enigma, with "Gravity of Love", from "Screen Door Behind The Mirror". I love the classical, opera background of the music. Finally, there is "Deliver Me", from Sarah Brightman's well known, "Eden". This song combines pop, new age, and gospel influence. I can safely say this album is worth listening too, and it shows the best of New Age today. If they make a Pure Moods IV, I hope it well include some older New Age wonders, like Mannhiem Steamroller and George Winston. For now, we have the music of today for our ears. Another great addition to the Pure Moods family! What can I say? 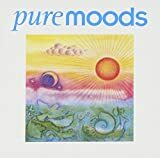 The Pure Moods series has always had a knack for blending the best music pieces from around the world, and bringing them all together on one awesome disc. This album features an impressive array of world encompassing songs, such as Enya's "Only if," as well as Native American music such as Sacred Spirit's "Dela Dela." Some songs like Kitaro's "Silk Road" even blend in a sound of the orient into this wonderous album. One of the best features of this album is that it gives you such a wide range of musical items to chose from, and if you like a certain artist or song, the booklet included gives you all of the information you need to find out what original album/movie the song came from! If you love New Age music, and if you love to listen to a broad variety of world music, you have to get this cd! This collection of Pure Moods CDs started with this CD and was definitely good enough to justify the rest of the entries in the series. These CDs start by taking pop songs, remaking them into semi-new age songs and then collecting them with other new age songs. They're nice and relaxing and just edgy enough to keep mainstream folks interested. Out of the series I would have to say that this is my thrid favorite. If you're heard the others then you should be satisfied with this album, if you're new to the series I would recommend picking up Pure Moods II. This is the kind of utter garbage they use to subdue wild boars in Papua New Guinea. An utterly wasteful collection of schlocky new-age pipey music, all under the guise of the "PURE MOODS" label. A friend gave me the original Pure Moods collection several years ago. I played it all the time! When II was released I hesitated to buy it because I felt it would have to be a disappointment after Vol. I. But it wasn't. II was another delightful surprise. Most of the songs follow the pattern and diversity of the 1st CD. Nothing compares to Pure Moods. Those songs are powerful classics. Friends still inquire about that legendary CD. Although the sequel is good overall, it doesn't quite have the mystique that I hoped for in the Pure Moods tradition. Only some of the songs take me away to another world--remember how they advertised? 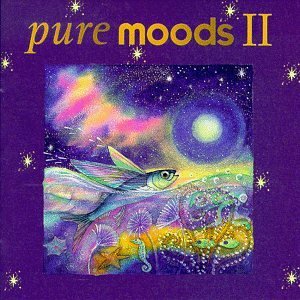 If you bought Instrumental Moods and Celtic Moods, then three of the songs on Pure Moods II will sound redundant, which was the greatest disappointment with me. One is a remix, but the other two are exactly the same. "Life In A Northern Town" was a great addition along with two songs by Loreena McKennitt and one by Yanni. Adiemus is always great, so "Zarabanda" hits pretty well. I felt that Virgin Records could have done better with the Enigma selection. 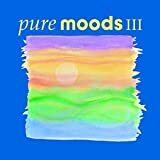 But, I'm still hoping for a Pure Moods III after I enjoy hearing Pure Moods II. Vive le "Pure Moods" series! One of the main reasons why I wanted to get this CD is because it has Yanni's "Nightingale" and the theme to "Chariots of Fire". Both those songs are not really New Age, but they are absolutely beautiful. I was expecting them to be just as beautiful as they were the first time I'd heard them. And believe me, I was not surprised! On the other hand, I was indeed surprised--no, shocked--to find Massive Attack's "Teardrop" in this CD. Massive Attack did songs for the soundtrack of the movie "Pi", which is all paranoid techno and definitely not "purely mooded." It turned out to be quite a pleasant surprise. Although "Teardrop" isn't much in the way of New Age, I could listen to it all day. It's got an awesome harmony and an eerie melody. Maybe it doesn't belong on this collection, but it's definitely worth listening to. However, this CD isn't without a few flaws. "Breezin'" and "Emily" are so out of place that they should be in a "Jazzy Moods" CD. "Life in a Northern Town" is also a little out of place, as it isn't nearly as atmospheric as most of the other songs in the "Pure Moods" series are. Finally, this isn't really a flaw, but it seems necessary to warn fans of the first "Pure Moods" that there's no Enya on this CD. But those are just a few minor complaints, and ultimately, "Pure Moods II" is worthy of your time and money. Other very good songs: "Beyond the Invisible", "The Cradlesong", "The Mummer's Dance", "Theme from Harry's Game", and "Monteczuma". In a nutshell: I pretty much agree with Amazon.com's editiorial review on this CD. See ya 'til I get "Pure Moods III". I've always enjoyed Pure Moods and this album is no exception, but while reading some of the customer recommendations posted on this page I discovered an artist by the name of Mehdi (pronounced meddie). After some investigation I found his site (SoothingMusic.Com) and listened to the samples...I also downloaded some of the free MP3 downloads that are available on Amazon.com. I was instantly blown away by the quality of this music and so I gave it a try and now that I have listened to his CDs several times I really must say that although I'm still a Pure Moods fan I find Mehdi to be a tad more interesting. I have them both in my multi-disc CD player and love the way they compliment each other. I highly recommend that you give this artist a try or atleast just go listen to the samples, I have a feeling you'll be glad you did. Yet another hit in a great series of albums! Music featured on these cd's are full of emotion, every emotion, all over the scale emotions and the beats are never ending! I am a big fan of the Pure Moods series. 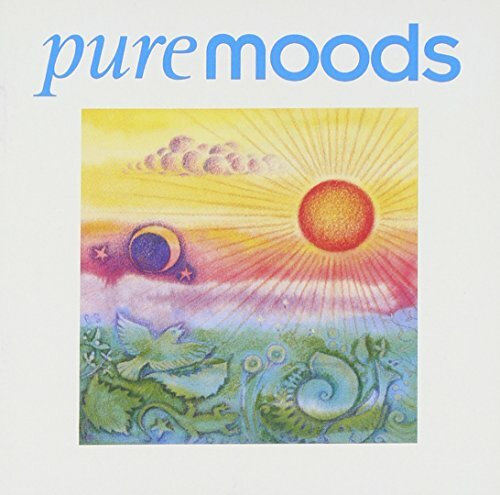 Never disappointed with Pure Moods cd's..
One of the better albums of its kind. I'm always a bit wary of these compilations, because I am more a Celtic purist than a New-Age crossover Celtic fan, and Narada delivers both. However, this one was given to me and it is pretty good by my standards. Connie Dover and Altan are always good--and though anyone into the genre probably has Altan's "Duluman" on any number of albums, I hadn't heard this track from Connie before. Particularly delightful to me was the Dervish piece. I hadn't checked in with them since Playing with Fire, but it seems they have really come into their own sound. The song is simple and elegant, and the vocals are beautifully controlled. There are one or two jazzed-up tracks here and one or two airy-fairy ones, but they actually do pull off what they are after. The dream-like subject matter and gentle harping of Ferry Me Across the Water, for instance, all but demand the whispery singing that accompanies them. All in all this won't become one of my favorite albums, but it is quite listenable, and a nice, variegated survey of what some of the more individualistic artists in the genre are up to. OK, if you like Celtic music at all buy this CD. It is one of my all-time favorites. Each song is completely different, some being upbeat like the Hebridean Hale-Bopp while others (like my favorite) are heartfelt and moving like "This Piece of Earth." All of the songs are high in quality and are sung by extraordinary woman singers. Although a few of the songs are not in English they manage to convey their emotions through tone and instrumentation. 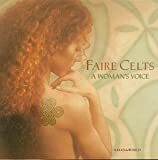 Following in the fine tradition of the Celtic Women CD, this arrangement of some of the finest Celtic female musicians is beautifully arranged with some amazing songs. The CD features a good mix of Gaelic and English songs. To me the Gaelic songs are wonderful. It has opened my mind to a whole new area of music. (I previously didn't like music where I couldn't understand the words). But this is incredible. In fact I thought the Gaelic songs on this CD were better than the Celtic Women CD. This CD is a perfect introduction into artists that those outside of Europe may never have the chance to experience. Only a few songs were disappointing, including Sinead O'Connor's version of He moved through the fair, which pales by comparison to Lorrena McKennitt's versions. Not experienced this type of music and are adventurous, buy it! I love this CD. I heard it playing in a local bookstore, and after two songs, marched right up to the clerk and asked, "What are you playing?" When she told me, I immediately went to the music racks and found it, and bought it. Every song in this compilation is beautiful in its own way. Some are contemplative ("I Am Going to the West"); some make you want to dance ("Hoireann O"). Several of them will bring tears to your eyes. There's a song here for whatever mood you're in. One of the most pleasant surprises was Sinead O'Connor's rendition of "He Moved Through the Fair"; the controversy that surrounded her almost made us forget what a haunting BeanSidhe voice she has. If you like Celtic music, or folk music, or women's music, get your hands--and ears--on this collection, ASAP. A hauntingly beautiful anthology of celtic music. Some of the tracks on this CD actually moved me to tears with their overwhelming beauty. The effect of Rumi's achingly poignant words set against a fusion of east/west music is sometimes quite meditative and transcendental. The only mistake I feel is the includion of Demi Moore who sounds as though she is reading these 'sacred' poems like a film script, unlike Madonna who appears to believe truly in what she is saying and mirrors Rumi's passion in her intonation of the words. Don't let this put you off, however, there are 35 other memorable tracks. I also disagree with some of the criticisms made on this site about the CD - take it for what it is and enjoy it. But please Deepak - confine your future 'friends' to those who have integrity and open hearts. A wonderful CD and a true 'Gift of Love' for anyone - even yourself. This CD is an absolute joy to listen to! It thrills your senses. It makes your skin tingle. It opens your heart to love, brings you closer to God, the universe and all beings. Usually I buy a CD, listen to it a few times and then it sits and collects dust. But this one is different. If I have a stressful day or whatever, I come home and listen to this and in only minutes I feel the stresses of the day leave me. I feel more grounded and as a friend said, it has the ability to put you in a deep meditative state. 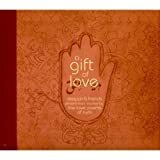 I would rarely give any CD 5 stars, but this one rates it easily and if you are at are familiar with Rumi - you know his words are profoundly deep and touching to the human soul. Deepak, You out did yourself this time -- A Fan! Rumi that we call him Molavi is a Dervish, who found everything in himself and love to the whole not to the single. He did not believed in any rules. His rules were his love to the world, to himself and us. All he just wanted to say is that there is something more than a materialistic life. Everybody who has not a background of the spiritual life especially in middle eastern countries will think of these poems as love to human, but Molavi believes that love is everything, and he himself is the God. When he says that God is here, just in me, it means that there is no conflict between loving myself and loving you. It is the same, we all love the same thing,God which is the whole existence of the world, everything you can imagine. Thanks to this team that tried to show the westerns that there is something more than fashion and this materialistic life. There are people who just live with their pure love to themselves and the whole and nothing more, and they are the happiest people in the world. Because they believe in that. I really loved this music, it reminded me of my country and my people and my history. Everytime I am trying to release myself from this prison which everybody is obliged to live in here, I listen to these gnostic songs. I am afraid that there is no special word for Erfan in English! As a wayfarer on the path, this CD has helped deepen my love and longing for God...I shed tears; my skin prickles as I shiver with deep knowing. The combination of the spoken word and music results in an intensified resonance which vibrates throughout my whole being. What a beautiful gift to us, Deepak...my heart thanks you! The language of love is universal and unearthly. The CD is quite captivating. I think it is beautifully done. I have bought 2 copies of it. One for a love and one of my own. Highly recommend it. My only complaint is that Mr. Chopra reads too many of the poems himself. The idea is the universality (word??) of the the cd, not hearing the same person again and again. Besides the fact that i am not a big fan of his voice. I recently found a copy of this album on one of my excursions to my favorite record store. I have been awfully curious to hear this album since I am also a big fan of classical/pop music. Plus the cd artwork was very intriguing and very Renaissance-like too. So I immediately fell in love with "State of Grace" the very second I put the cd into my stereo. I was fortunate to have found this cd... I found Lisbeth Scott's vocals very soothing and comforting to listen to, especially this morning when I was drinking coffee from a local coffee shop. I particularly enjoyed the stunning cover of "Amazing Grace". "Amazing Grace" has always been a beautiful song but it is even more beautiful with Lisbeth Scott singing the lyrics. I also really enjoyed track #3 "Miserere" and Auguries of Innocence part 2". "Be Still My Soul" is a stunning masterpiece. The lyrics really touched my soul. I found the song really soothing to listen to. Part of the credit goes to Lisbeth's restrained vocals and the breathtaking lyrics. It has been awhile since I have heard an album as beautiful as "State of Grace" it is awonderful album. I loved the album artwork. It has that Renaissance quality that I have always loved. I'm so glad that I came across this cd by chance. It is simply stunning. If there was one track that didn't really float my boat was the last track which kinda makes me drowsy, especially when I listen to the cd at the office. Overall I loved the cd. I haven't been able to stop playing it non-stop since this past weekend. Paul Schwartz, the genius behind Aria and Aria 2 (he is also responsible for Revolution that I like much less) writes and arranges the music for this collection of songs and instrumentals. It's a hit and miss kind of thing - hit when he allows Lisbeth Scott's unusual and lovely voice to explore the gems like Veni Redemptor or Angelica, miss when he concentrates on instruments in Auguries of Innocence or decides to suddenly do a bad rendition of Amazing Grace or Simple Gifts. Veni Redemptor and Amazing Grace almost seem like they came from two different albums made by two different people, so stark is the contrast. I recommend this for those fans of Aria that just have to have more - now - and can't wait for hopefully a better outing from Paul Schwartz next time. This will satisfy an appetite a little. It's definitely one of the more beautiful "holiday-oriented" or "spiritual" albums you will ever hear, too. But it doesn't measure up to what it could have been. I've always enjoyed Paul Schwartz and this album is no exception, but while reading some of the customer recommendations posted on this page I discovered an artist by the name of Mehdi (pronounced meddie). After some investigation I found his site (SoothingMusic.Com) and listened to the samples...I also downloaded some of the free MP3 downloads that are available on Amazon.com. I was instantly blown away by the quality of this music and so I gave it a try and now that I have listened to his CDs several times I really must say that although I'm still a Paul Schwartz fan I find Mehdi to be a tad more interesting. I have them both in my multi-disc CD player and love the way they compliment each other. I highly recommend that you give this artist a try or atleast just go listen to the samples, I have a feeling you'll be glad you did. I already wrote a review for this back in 2001. I just wish I would have given it 5 instead of 4 stars. Listening to State Of Grace is a beautiful, uplifting experience that exults the spirit into higher places, and the multi-talented Paul Schwartz has quickly become one of my all-time favorite musicians. He composes and orchestrates all the music while Lisbeth Scott's angelic voice glides like softly felt wings that radiates a deep sense of majesty over the ambient beats and the glorious strings and church choirs that sing their heavenly praises to the mighty forces that we must first believe in order to perceive. But fear not. You don't have to be religious to enjoy this. Just open your mind and, most importantly, your heart and let it wash over you... That's all I ask. This is now one of my top 20 most cherished albums and that's saying a lot since I currently own over 500 cds! Pure flamenco or not... enjoy it ! Dance in your car! *Guitar Greats, The Best of New Flamenco* at first sight might look like one of those 'Various Artists' loss leader compilations you see on Info-mercials or UHF stations at two in the morning. Or you might mistake it for the traditional, Segovia version of flamenco. But NOoooooooooo! This disc is really quite good! It is a fine collection of energetic, up-tempo, well-rendered and well-sequenced songs in the 'nuevo flamenco' style. Contributions from Govi, Young & Rollins, Strunz & Farah, Ottmar Liebert, Nova Menco, Oscar Lopez, and other artists make it first rate. I'll guarantee it. Most of these tunes will cause you to dance in your car or your office chair, or just plain get up and dance. My spouse brought it home after hearing it playing in Borders. We soon discovered this is great car-driving music, especially with the sunroof and windows open, hair flowing in the wind. 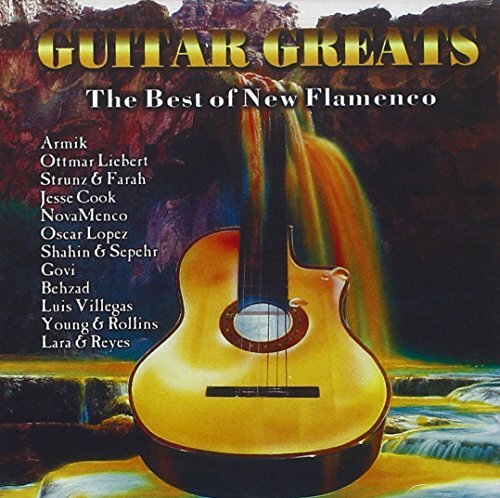 Jesse Cook:- "Free Fall" "Vertigo" and "Gravity"
Ottmar Liebert:- "Innamorare - Summer Flamenco"
Armik:- "Rubia" "Rosas del Amor" and "Gypsy Flame"
Next, I'm planning to purchase a couple from "Govi"... Is this testimony enough that "Guitar Greats - The Best Of New Flamenco" is a superbly GREAT buy? This CD is absolutely fantastic!!! I have been listening to this almost everyday since I bought this a few months back. Its really great, especially after a long day at work - a fabulous way to unwind..it totally transforms your mood. Its soothing and at the same time invigorating, very rarely can something be both. Also goes well with a glass of wine, with a book, for a nice evening with your partner, almost anything!! Even my 10 month old daughter just loves it! And, oh yes, the guitar work is stupendous, out of the world - if you are a guitar aficionado, you GOT TO HAVE THIS. Flamenco solo guitar has always been innovative ever since Ramon Montoya (the father of flamenco solo guitar) started to include classical guitar techniques in the beginning of the 1900's. Then came Sabicas and Niño Ricardo who by todays standard are considered 'traditional' or 'classic'. Then in the 70's came Serranito, Paco de Lucia and Manolo Sanlúcar that started to mix influences from other musical styles into flamenco and are the founders to what is modern flamenco solo guitar today. Countless young guitarists have been influenced by these three guitarists; Tomatito, Vicente Amigo, Gerardo Núñez, Juan Manuel Cañizares. Four accomplished female vocalists--Mary McLaughlin, Connie Dover, Maireid Sullivan and Emma Christian--offer haunting and heartfelt renditions of both new and traditional tunes, gently accompanied by an assortment of instruments. The voices of the vocalists, though not heard concurrently, are remarkably well-matched--rich, velvety, resonant and bell-clear. A standout number is the striking lament "Sealwoman/Yundah" by Mary McLaughlin. My other favorites include Connie Dover's wistful "Siuil a Ruin", and "Cantus" (her multi-tracked take on the carol "Personent Hodie"), Maireid Sullivan's bluesy version of "The Water is Wide (Waly Waly)", and singer/harpist Emma Christian's plaintive "Little Red Bird". 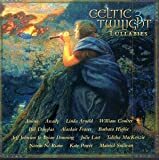 For more music by and about Celtic Women, try the Green Linnet's 3-CD set, "The Voice of Celtic Music". this CD is amazing. The voices fo the women are hauntingly above the normal human voice. The selections really emphasize the talents. 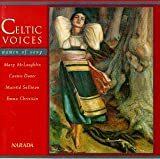 In song number 5, Connie Dover truly shows the magical Celtic music experience and proves that she is one of the best, along with the rest of the wonderful ladies on the CD. A definite must have for anyone who truly loves music and the magic that it can create. True to the title of this CD, each of the recordings showcases the vocal talents of the four featured women to a full extent. The music is a combination of very traditional songs and more recently written, New-Agey selections, which complement eachother very well. Some of the better tracks (they're all pretty good) include: the haunting, pleading "Bring the Peace"; the playful harvest song "In Aimsir Bhaint an Fheir"; the tragic traditional song "Siuil a Ruin"; and the contemplative "Waly Waly," better known as "The Water is Wide". Perhaps my favorite track, though, is "She Moved Through the Fair," a song which has been recorded by many artists, but never more beautifully than Maireid Sullivan. If you're a fan of Celtic music, or just enjoy hearing beautiful voices, buy this CD - it's definitely a must-have. "This is the celtic compilation cd to buy"
I am so glad I purchased this cd. If you love celtic music, and love the women of celtic music, this is a must. Personally I feel celtic music is much more haunting and beautiful when sung by a woman. Here are 4 women all with beautiful, but different voices offering you a sampling of haunting irish tunes. Songs are done in both english and gaelic. What I like is that in the booklet all the words to the songs are printed out. On the gaelic songs it has both the gaelic and english words printed. My 2 favorite vocalists on this disc are Connie Dover and Emma Christian. I have Connie's albums and she is one of the most gifted vocalists out there. "Cantus" is a lovely song about the birth of Christ, and his mother Mary. I will definately play this one at Christmas time. Her other songs are equally beautiful also, and can be found on her albums "The Wishing Well" and "Somebody". Emma Christian I had never heard of before until this cd. She has an amazing voice. Her "Birth In Bethlehem" (also Christmasy) is so haunting and chilling. Emma sings in Manx Gaelic with very little or no musical accompanyment. I went to seek her album on the internet after hearing her music. Unfortunately it is not available in the US. I found a few online British music stores, but converting from pounds to dollars and paying international shipping is just too much of a hassle. I finally found ONE place in the US (online) that had it. If you purchase "Celtic Voices Women Of Song" and love Emma as much as I do, feel free to e-mail me and I will tell where to go to find her disc. As a lover of piano music, this has to be one of my absolute favourite CDs. It is pure class from start to finish, showcasing the enormous talent on the Real Music label. This 15 track CD soothes, relaxes and entertains. It is not merely just background music- it deserves far more than that. The gorgeous melodies that flow from the hands of such accomplished pianists as Kevin Kern, Jim Chappell and Paul Machlis caught my attention immediately with their immense beauty and the undoubted skills of the men behind them. Highlights include anything by Kevin Kern, and "Gone" by Jim Chappell is a classic. Paul Machlis impresses with his two Celtic-flavoured contributions "Buchanan Mist" and "Nightblossom". Other contributors include Danny Wright, Bernward Koch, Michael Hoppé, Brian BecVar, Peter Kater and the ever-popular 2002. Five out of the 15 tracks were composed for this CD. At nearly 68 minutes in length, this CD represents excellent value for money. High quality packaging and production is to be found here, as expected from a label with such a high reputation as Real Music. Released in 1997, it is now surely time for a second collection of piano classics. An excellent CD from start to finish. Put simply, this CD is a piano-lover's heaven. I am a massage therapist and I have had a lot of clients ask me for the title. Just the right length for a one-hour massage. 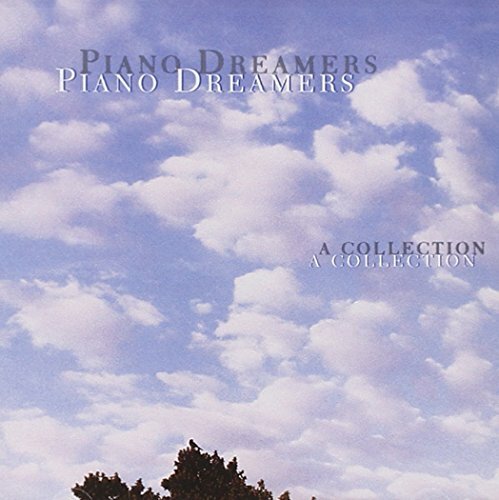 Loved this soothing collection of piano music. The fourth star in this rating is as much for the historical importance of this album. Recorded in 1968, it was for many people the first introduction to Indian classical music, other than Ravi Shankar. In particular, it made Shivkumar Sharma and Hariprasad Chaurasia, then aged about 30 and on the cusp of great international careers, better known to audiences outside of India. I find the album itself to be enjoyable enough; however, it is not the first CD I reach for when I wish to enjoy quality Indian music. The problem for me is that Indian classical music at its finest sees the musicians improvising and exploring a Rag to its logical ends. A performance of a single Rag can easily last for at least an hour or more, but none of the tracks on this CD last for more than 12 minutes. Indeed, the original album was less than 40 minutes long, owing to the technological limitations of the day. In other words, the subtleties and complexities of the classical Rag cannot be given their due in a 6 to 12 minute performance. That being said, I still believe the perfomances are top notch and deserve listening. However, do not consider this to be the last word in Indian music. From the other reviews, you will notice a consensus regarding this recording. 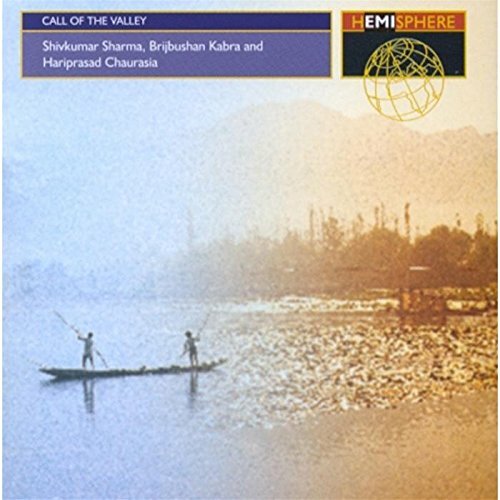 All are Indian music fans of one sort or another, but each expresses a distinction regarding this recording that elevates Call Of The Valley above other Indian music albums available in the West. I've been experimenting with Indian music for a decade now, my first exposure being with Jai Uttal, a student of Ali Ahkbar Khan. No one is unexposed to Ravi Shankar who is interested in Indian music. It just goes with the territory when searching through the genre, and to be fair he is an excellent artist. Yet, I always knew there was something pure in Indian music that I was missing when I purchased or listened to these other artists who have been thrust upon the West as the flag bearers of the Raga, sitar, and tabla. Even those inexpensive off-brand traditional Indian music albums seem too conservative and lack the heart and soul that India's spirituality is known for and offered a more conservative recording. It was not until I came across this album that I found what I had been searching for all this time, perhaps without truly knowing it. This is the first item on Amazon I am granting a 5 star rating. Call Of The Valley ...... how does one describe it? There is something to this album that is unique and magical. Many of the albums that I've listened to, such as The Best Of Shakti are artistic in their own merits, but do not have the ability to transport me to another place, whether it is the fertile valleys of India or an astral voyage of my own making. Call Of The Valley has this power. It is not just a musical summoning (from its title), it is an enchantment for the listener. I am an ABCD. I used to think my parents were crazy when they tried to get me to listen to Classical Music. At the time I would have much rather listen to Hip Hop. But this one, I've been listening to everywhere, since I was in highschool. Its great car and study music. But the best part is, it prompted me to learn more about classical music, and develop my own tastes. Now I listen to original classical music, as well as fusion and remixed. This recording, released in 1968, is the best selling Indian classical music album ever released in India. The choice of Ragas - which represent a shepherd's journey from morning to evening - is just excellent. The three instruments - the hundred-stringed Santoor that gives sounds of water flow, the soul-stirring Flute, and the innocent Hawaian Guitar - blend seamlessly and each artist gets equal 'musical space'. 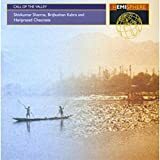 Indian classical music is steeped in spirituality and this album gives a quick but very effective introduction to the ocean of Indian music, especially to the uninitiated. The talent, toil, passion and devotion of the artists on this ensemble collection cannot be surpassed. Though every cut is outstanding, some prove even more dynamic. The virtuosity of Jesse Cook and emotional arrangments and percussion on Bozzio Levin Stevens "Duende" are riveting. Di Meola's "Mediteranean Sundance" can only be topped when listening to it on the live San Francisco album when joined by de Lucia and John McGlaughlin. Anyone contemplating negative commentary on this CD needs to "take a deep one". The end sum of years of bleeding fingers, lifetimes of devotion to thier art and passionate hours of playing easily total a millenium! An absolute gem in any collection - whether you know it or not! This is not traditional flamenco, but rather a mixture of flamenco, Latin and jazz wrapped together to make for seventy-minutes of pure listening joy. The flamenco style is definitely the overlying theme of the album filled with tremolos, rasgueos, glopes and lightning-fast runs. Everyone that appears on this album is a master of the guitar, from those you'd expect like Paco de Lucia and Al Di Meola to those who will surprise you, namely Slash. Fourteen tracks and sixteen amazing pickers provide a varied flavor for this album. Jesse Cook starts the album with "Rattle and Burn" and sets the tone with this rumba-sounding piece. His melody comes off effortless with elegant ease. A very nice sounding piece. There is something special about two or more guitars playing at the same time, which makes "Heat of the Sun" from Strunz and Farah a joy to listen to. Each guitarist has their own voice and they counterbalance each other well. Plus, the speed of these guys is unbelievable. A more classic sounding piece comes from Oscar Lopez from his piece "Fire and Fury". Lopez is a master of the guitar and music as can be seen from the way he changes speeds throughout this piece with fingers a blur. Ruben Romero turns in the star performance of this album with his rendition of "Malaguena". His slow intro gives way to increasing speed, and his techniques will leave your jaw dropped. 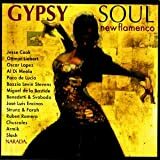 Compilations like "Gypsy Soul" are great in exposing you to many artists at one time each with their own sound and nuances. This allows you to follow up with the artists that you enjoy the most. There isn't a dud on this album, and the talent and sound will leave you begging for more. The musicianship in "Gypsy Soul" is excellent by any standard. However, if your looking for a "pure" flamenco disc, this isn't it. My overall impression is that "Gypsy" is a very good collection of artists discovering new directions in which flamenco can be taken. There are tracks that lean more on the traditional side like Oscar Lopez on "Fire and Fury" and Ruben Romero on "Malaguena" but for the most part gypsy blends with other musical styles. At the low points, some of the tracks seemed tainted with a "new age" sound that added a kind of cheesiness to an otherwise beautiful performance. The high points more than compensate with performances that are technically jaw-dropping, but avoid being showy or boastful. The playing is fluid and passionate. This disk will quickly transport you to sun-drenched exotic places. I bought it a couple years ago and I still play regularly. Not one of those discs you forget about or use as a coaster. I just had to warn you! DO NOT BUY THIS CD! THIS IS NOT REAL FLAMENCO! IT'S NOT EVEN REAL JAZZ OR LATIN MUSIC. IT IS HOWEVER: MUZAK. You know..that piped in stuff that you hear while travelling in an elevator or walking through your local mall. DO NOT BE FOOLED THIS MUZAK HAS NO REAL SOUL. 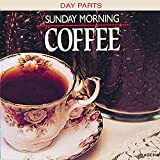 This is a nice variety of soothing sounds, with a blend of instruments and the aroma of differing musical styles, but each meant for relaxation, and stimulation. Those of Davis of Steamrolling fame are his usual good stuff, while the guitar and piano pieces are simply exquisite. Can't personally recommend these for Sunday mornings, since we all should be gathering at church, but for those other appropriate times, this is nice collection to sip coffee with and ponder the grandeur of God's created universe. If you have passion in mind, this is it. I've owned this album for some time, and I can assure you that you won't hear this in any homily. This is about love, passions, and the wonder of being with that most special person in the quietude that somehow is Sunday morning. The selections ease from early-morning tenderness through intimacy and back again, making the composition of the ambum itself as impressive as each of its tracks. For lovers, for lovers on Sunday Morning, this is that album. Enjoy. It, along with its composer Richard Burmer, had been booted off the re-release of "Western Spaces", in which Burmer shared billing with Steve Roach and Kevin Braheny. Burmer's work on that album provided a third melodic aspect to that album to go with Roach's ambience and percussive sound, as well as Braheny's EWI woodwind synth. The new version of "Spaces" is less versatile than the original release as a consequence, but at least Burmer has made his best track there--"Across the View"--available to those who weren't as lucky as I was to catch the original release. To call this song "pretty" is an oversimplification--Burmer uses a Fairlight-style string patch as lead, as well as adding a fretboard-oriented scaling to the Rhodes piano sound he uses as backup. An interesting mix, especially in view of the fact that guitar synths weren't capable of the resulting sound back when this track was recorded. You will wear this one out! I didn't think it was possible to wear a CD out, but with this one we have. It is the perfect background music to all sorts of situations, dinner parties, open houses, etc. and we play it often. The music is relaxing but not "sleepy," interesting but not overbearing, and just plain wonderful. We are building our Chip Davis/Manneheim Steamroller to include most everything out there, and have yet to be disappointed with anything, but this one in particular is a favorite. Stephen Bennet on a Dyer Harp guitar, Pat Kirtley's bell-like guitar work. If this is your genre, it does not get much better than this...varied and surprising. Check it out. This is well done....not the BEST compilation guitar finger-style CD, but worthy. A tasty sampling of six string sweetness. This CD nearly made me sell my acoustic guitar. I mean, why even try right? "Sad little girl" maybe one of the prettiest melodies ever written. This song makes you want to trek through some lovely woods on a fall day to a log cabin, where you sip warm apple cider beside a fire as the sunsets and soothing melodies envelope you. This cd warms and awakens my soul in a way that no musical selection ever has before. This is a must get, especially for guitar buffs, but for anyone who enjoys beautiful melody and technical proficiency. Recording quality superb, perfectly balanced. Fantastic! I bought this album because I am a fan of Leo Kottke, and because I had heard of Billy McLaughlin and Eric Tingstad. 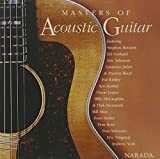 What I discovered was a group of unbelievably talented guitarists I'd never heard of such as Don Ross, Bill Mize, Pat Kirtley (my personal favorites in this particular album). Every song in this album, without exception, is a keeper. I went out the next week looking for more albums like this. I'm hooked! Excellent collection of fine artists showing off! Mozart as you never heard it before. Just when you think there is nothing more that can be done with Mozart, along comes this album. The interpretations are so fresh and different that I felt I was relearning Mozart. I think he would be very proud. A Different Mozart -- The right title for a delightful CD. If you love Mozart, try this album. Interpreters such as Bela Fleck give us a chance to appreciate the enduring beauty of the music, and all of the selections are beautiful in their own way. Each of the pieces is too short for my taste, but that does allow for many different interpreters on the CD. I'll definitely buy the follow up to this album. This More-zart CD should be 10 stars out of five. I have been listening to this CD for quite a while and I still like it. It never bores me. First, the transcriptions are done ingeniusly. Second, all the works are done by different musicians and thus the the play styles are all different. This is really QUITE A DIFFERENT More-zart. For example, Ruhe Sanft is an aria in 3/4, but it is beautifully transcribed in 4/4. At first listening, I didn't know what it was, but it sounded like I heard it before, and I couldn't figure it out. Only after I checked the song list and tried second careful listening, I was able to be aware that it was indeed "Ruhe Sanft mein holdes Leben". Every piece in this CD is beatiful. I am sorry that I can give only five stars. I will definitely give it 10 starts out of five. 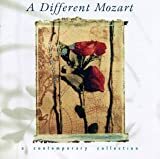 I wish there would be "A Different Mozart II". wonderful hommage without being too "new agey"
This is a great cd for when you are looking for the essential experiance of classical music while still having it sound fresh and interesting. This music is wonderfully relaxing, as other reviewers note, but I'd like to add that there's a spiritual or mystical side to this lovely CD. I first realized this while listening to Stream of Dreams on a quiet, peaceful, and moonlit evening. By the second cut on the CD, "Sheltered Stone," it seemed to me as though the music were arising from the stream itself, as if it were always there, even though we can't hear it in the hustle and bustle of our everyday lives. Stream of Dreams seems to capture the collective spiritual voice of the chattering stream and singing birds, and invites the listener to take part in its gentle reverence. I bought this cd hoping that the music will provide a better atmosphere for yoga, meditation, and relaxation. After hearing the first track, Morning Light, I was into this cd. The music is soothing, calm, and relaxing. The sound of flowing water in the background is an addition to relaxing. This is a great compilation of nature, music, and water. Listening to this after a stressful day will restore your mind and spirit. Stream of Dreams is a fine addition to the Solitudes collection. This title is one of many by Dan Gibson that is useful for transporting your client to another world during the massage session. Therapists will find this wonderfully relaxing to work to! This music is great. The best so far. I use it to metatate. I can close my eyes and picture my great-grand father as a child on the reservation and I can see a happy child in the yeay 1866.There isn't much out there to put me in a space of peace. "THIS KNOWLEDGE WILL COME TO YOU..."
The music is very POWERFUL. Its power is so subtle that I didn't comprehend it at first. Now I do. The Indians deserve our respect. They are in touch with their Spirits. I WAS LISTENING TO TRIBAL WINDS." Soar my friends. This will aid you in your journey. My Highest recommendation to the Seekers. TRIBAL WINDS is a FIND. Wonderful relaxing music. Excellent when used for at home spa. Assists with meditation and brings onself closer to their spirituality. Not to mention calming to cats. I have always listened to First Nations music and from the very beginning was captivated by the Native American flute. Its sound was nature itself; a combination of a soaring hawk, the wind whispering through night pines and birches, the melancholy cry of the loon, the lone wolf howling at the moon. Various styles, phrasings, techniques, and types of flutes are used here. 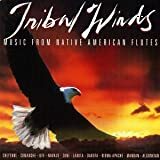 I have just recently started playing the Native American flute, and listening to songs from "Tribal Winds" gave me ideas on where to start with my own compositions and gave me new tunes to practice. This collection perfectly demonstrates the various voices and emotions that a skilled flautist can bring to the music. "Tribal Winds" captures that breathless moment as the artist puts the silent flute to his lips and then spins the first notes of the tune. It is the story of the land, a story of sorrow and triumph. If you seek peace in your life, this music can help you along your journey. All of the tracks on this CD reflect the very best of the diverse world of New Age music. Not generic or annoying, this collection is soothing and pleasant, creating an ambience of tranquility, just as its title implies. High caliber composing and musical sophistication is evident throughout. Among my extensive new age and ambient collection, this one remains a favorite. As I find myself "aging gracefully" (hah! ), music has become a daily healing necessity. 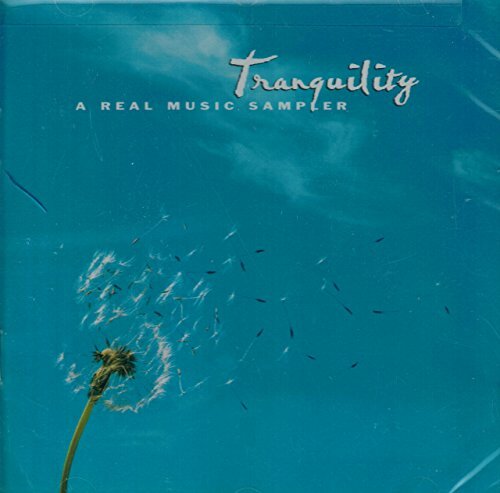 This CD is perfect for anyone seeking tranquility. It is absolutely beautiful, a joy to listen to. I loved this CD! It is a great CD for those who like to listen to classical music, but not the regular classics with screeching violins and loud orchestras. This CD has beautiful melodies that are great to go to sleep to or wake up to or sit in the bath tub and listen to. It's wonderful, listen to it if you need to sit back and relax. I found this CD at Christmastime 2 years ago. I have given it as a gift to several friends. This disc gives you a great feeling of peace and quiet. Excellent for use in meditation and yoga. This CD was originally created to go along with Neale Donald Walsch's book by the same name. Whether or not you read or agree with the book is completely up to the individual listener. The CD speaks for itself, and it does so eloquently. It is a compilation of New Age music crafted into a CD that creates a soothing, relaxation enhancing back drop. And the appeal isn't limited to New Age fans. My grandparents use this CD for background during their bridge parties and book club meetings. My best friend puts it on at night for her newborn baby. Even my New Age hostile mother never argues when I slip this CD on the player. Out of the fifteen tracks on this disc, there isn't one that should be discarded. Her Knees Deep In Your Mind by Ray Lynch is the first selection on this CD. It's unsurprising that some listeners have bought the collection after sampling that song alone. If you can, check out the audio sample available here. Other artists on this album include Jim Brickman, David Arkenstone, Yanni and George Winston, to name just a few. If nothing else, this CD offers the New Age listener a feast of styles, instruments and artistry to sample. I've discovered everyone has their favorites. Some love the piano performance of If You Believe by Jim Brickman. Others are drawn to the more esoteric works, like Shadowfax's Angel's Flight. Compilations are an excellent way to explore new artists without committing to an entire album by said artist. This particular compilation has made a wonderful gift for many friends and family. The title is slightly misleading. While the compilation was put together by the author of the book by that same title, there is no necessity to read or subscribe to the ideas in the text to enjoy the CD. Most, if not all these chosen pieces were first recorded well before this book was ever written. This is excellent background music, or meditation music. I don't recommend the second or third CD compilations created under the same title, as I found the music choices less inspiring or interesting. 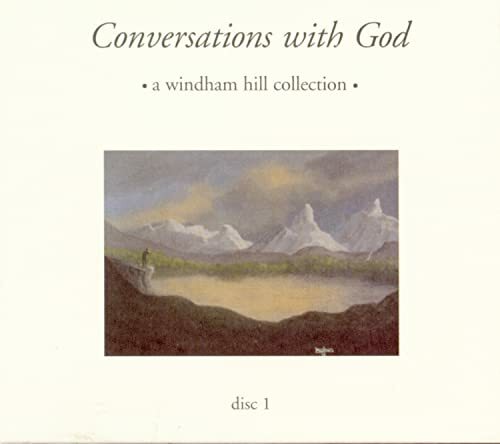 I love the music of Windham Hill, and this disc is no exception! Compiled from 14 different artists, each and every track is incredibly beautiful. The White Spirit (track #13) by Uman is evocative and Reflection (track # 6) by Oystein Sevag is just one of those songs that transports you. I have a disc for my car, which just sets the tone for the day! The music is varied, including such artists as David Arkenstone, George Winston, and Patrick O'Hearn to name a few. The music is soothing, yet evocative at times and can transport you to the depths of your soul if you let it carry you away. Great compliation - just another great winner from Windham Hill! When I first heard a track of this CD, I didn't know the CD's title nor even the exact music genre. Yet, I knew one thing after hearing only one track. I had to purchase it. I tracked down the name of the CD and bought it immediately. So, I was braced and prepared to be disappointed because I hadn't listened to the entire CD before purchasing it. What a wonderful and uplifting surprise to find myself absolutely mesmerized and seduced by every single track of this excellent CD. It would be misleading if I said the CD gets progressively better beginning with Track 1 because every single track will offer you something extraordinary. (Track 13 is the grabber for me.) The power of this music is masked by its ethereal qualities, but powerful it is. After sharing this music with so many of my relatives, friends and co-workers, I'm convinced that this music can only be explained by whatever defines you. It will reach, touch and soothe anyone's core. I purchased a second copy of this CD for my car. I'm a big music lover but I've never done that before. It's the best musical decision I've ever made. I first heard this album from a friend and I tell you, it's an absolute must have. The music is so soothing it allows you to get in touch with your inner self. If you listen under the right circumstances you could even get into a sleepy state that puts you in touch with your subconscious self. Fantastic! Highly recommended! This is an ok CD to pop in your player if you're wanting some decent background music, but there's nothing particularly gripping here. It's actually kind of boring, and I love Egyptian music both traditional and modern. This is like elevator music's interpretation of Egyptian music. I'm to the point in my musical collection now where if something doesn't reach out and make think "Wow... that's freakin' awesome/beautiful/etc!" I don't bother with it. And this just doesn't do that for me. But, hey, it IS cheap. I'll give it that. So, it's not as if you're going to be out alot of money by giving it a try. This may be a good "wading pool" CD for someone getting used to more eastern music. This is by far the best I've heard yet when it comes to music of Ancient Egypt! This is unusual music. kind of techno dance music with an egyptian vibe to it. now it is not real up tempo or anything. It is a bargain at amazon for the price. I listen to all types of music and this is a good one for my multidisc cd player. You should like this if you like electronic music or if you are just interested in ancient egypt. I love these CDs! They're for the most part excellent, but at points too many electronic instruments. Most tracks are great, and you can't beat the value.